Beloved actress, writer, script doctor, talk show guest, and dog mom Carrie Fisher may be gone, but she left an indelible mark on the world. From her critically acclaimed novels to her fearless humor, she made every room brighter, every interview funnier, every moment a little less dire. That's ultimately what made her passing -- at the tail end of a ruthless 2016 -- even more grim: We could really use Carrie's incisive worldview right about now. That's part of what makes her final appearance as Leia Organa in Star Wars: The Last Jedi so powerful. Every moment feels like a subtle knife in the gut, a reminder that we're without our steadfast general in real life. But it's also a brilliant and touching accidental sendoff (Fisher had completed her work on the film before her death), full of gravitas and poignancy that feel cosmically coincidental. Director Rian Johnson couldn't have known Fisher would soon pass, but he telegraphs her legacy in moments small and large, from relationship moments to a splashy moment of Force use that's so audacious and whacky that it winds up being strangely beautiful. 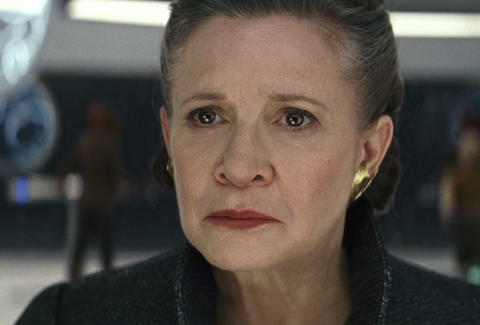 Here's a closer look at all of the ways The Last Jedi subtly says goodbye to our intergalactic princess, including one of the most exhilarating uses of The Force in the series' history. For a minute, it looks like The Last Jedi is actually going to kill Leia in this moment. As she hovers and crystalizes in the vacuum of space, and her theme music plays lightly in the background, it feels like the series sending Leia gently into her next life. But then her hand starts to move, and her eyes open, and in a show of strength she summons the Force and levitates back to her damaged ship as the music swells triumphantly. Leia summoning a Force bubble is a pretty insane moment, to be honest, one that feels a little jarring on the first watch. It's certainly a bold creative choice, and fans will probably be divided on its efficiency. But it's hard to deny the power of John Williams' score, and the fact that this is our first time witnessing the extent of Leia's Force powers, which normally lay dormant. It shows us that Leia is picky about how she chooses to brandish her own power, favoring military precision over laser swords. And honestly, that makes her even more badass in retrospect, and gives Carrie Fisher a chance to finally flex the Force muscles she never got to wield in the previous films. 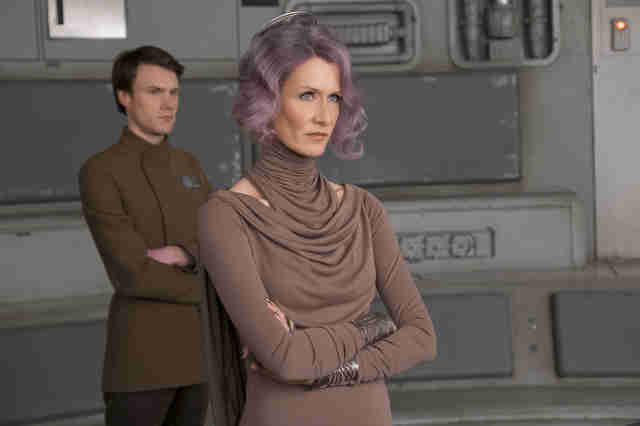 The movie dedicates some time to convincing us that Vice Admiral Holdo (Laura Dern) is a selfishly motivated leader with only survival -- and not change -- in mind. After Leia is knocked out post-flying moment, Holdo steps in to lead the Resistance, butting heads with a freshly demoted Poe Dameron. But it's really a subversion. Holdo is, in fact, waiting until the Resistance ship is close enough to the planet Crait, where a former Rebel base remains hidden from the First Order, so their members can escape on the shield-and-weapon-less shuttles and regroup. Holdo ends up sacrificing herself once the ship is empty by blasting it in lightspeed through the First Order's Star Destroyer. But before the Resistance evacuation, Leia and Holdo share a touching moment of friendship, where Holdo reminds Leia that she's strong enough to survive another loss. "May the Force be with you," Leia starts to say before cutting herself off, admitting that she's said the phrase enough. So Holdo says it for her: "May the Force be with you, always." Leia and Holdo's relationship is explored in more depth in Claudia Gray's excellent tie-in novel, Leia, Princess of Alderaan. But the weight is fully seen and felt in their final exchange. It also feels like a message for Carrie. The Force is still with her. On Crait, the Resistance is about to lose all hope. They're trapped in a military bunker. Their resources are dwindling. Their people are dying. And just as Leia is about to resign herself to this grim reality, her brother Luke Skywalker appears out of nowhere. 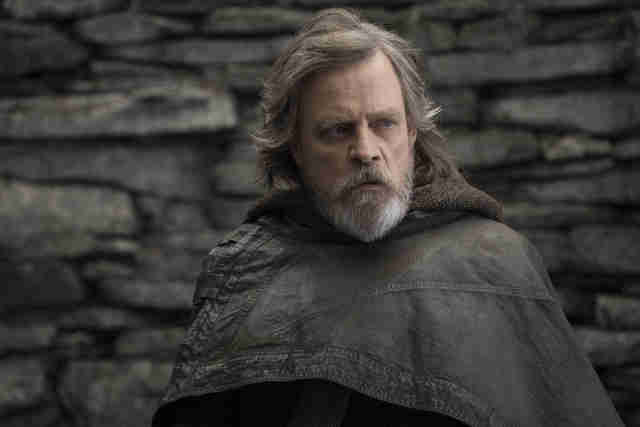 Of course, the scene is a bit of a diversion, as Luke isn't physically there: he's Force-projecting himself to Crait from Ahch-To. But it's still undoubtedly Luke, and as we learn by film's end, he knew he was saying goodbye -- though there's no way Mark Hamill could know that the scene also works as a goodbye to Carrie Fisher. His lines -- about how we're never really gone -- are punctuated with the gravitas of her being gone. It's Luke and Leia saying goodbye, it's Mark and Carrie saying goodbye, and it's us processing her death through final union of our childhood heroes.